A great recipe for from-scratch Sloppy Joes. I’ll eat Manwich from a can too, but this just seems a lot fresher. It’s a big recipe, our family always has like half of it left over. Heat oil in large frying pan over medium heat, saute all veg until soft. Add garlic, cook 3-4min. Increase heat to med high and add gr. beef, cook until browned (10-12 min). Season with salt&pepper. Lower heat to medium and add liquids. Cook 15-30min until sufficiently reduced & thick. I am rewriting my old post about bread, to make it simpler and better organized. I’ll leave the old one up there for reference though. Using a dry 1 cup measuring cup, measure out 6.5 cups of all purpose or bread or baker’s flour into a temporary/staging vessel. Scoop heaping cups and scrape them level with the back of a knife. For the last 1/2 cup you can just eyeball it. 20 min into rest, put baking stone into oven, also an oven-proof container with a few cups of water, and preheat to 450. Eat within 1 day, or slice, bag, and freeze. Here are specifics of my implementation of the method, which I’ve worked out after making this bread for a few years now. When you’re just getting started, instead of a lidded bucket you can use a big mixing bowl covered with a dinner plate, but it’s messy, and if you start making bread regularly, a bucket is a lot easier. For my money, the best mixing buckets are 5-quart ice cream buckets. Don’t buy just any bucket of ice cream though, because 4 quarts is not big enough (for this amount of bread dough, nor is it enough ice cream!). If you read the reviews, you can see that a lot of people buy these 6qt buckets to make this kind of bread. Amazon sells a really nice 1.5 Tbsp measuring spoon, probably just for this book’s fan base. Otherwise, 2 Tbsp coffee scoops are easy to find anywhere. Carefully measure 1.5 Tbsp of salt into the scoop and mark the level with a sharpie for future reference. You can use a sturdy wooden spoon, but the best tool for mixing is a Danish Dough Whisk. Seriously, it works SOOO much better (and it’s also great for pancake batter). Just a few flicks to spread the salt and yeast through the water, then dump in all the flour at once, and stir it up. For “cover loosely”, I drill 5 quarter-inch holes in the plastic bucket lid. It is important to keep these vent holes clear, or the yeast exhaust gets trapped and makes the bread taste beery and bitter. Sometimes a fresh batch will rise so much it plugs the holes, in which case you give the bucket a slam onto the counter to knock air out, and then clear the holes. The recommended surface for cornmeal and pre-bake rest is a pizza peel, but a cutting board or baking sheet would work just as well. We never slide bread off our peel anyways; we just gently pick the loaves up and place them on the stone. You can recapture extra cornmeal with a flexible cutting board and then pour it back into whatever you keep cornmeal in (I buy bulk cornmeal from Henry’s and keep it in mason jars). There are lots of baking/pizza stones out there, the ABin5 website warns against Pampered Chef baking stones, apparently they break a lot. For a water/steam vessel, I use an old bread pan (rusty, and getting rustier). Best way to dry it out afterwards is to take it out with the bread and dump it, then its heat will dry it completely. Using pyrex is possible, but DO NOT add water to heated pyrex, it will explode. For post-baking rest, if you have a non-flat-top stove you can put it on a burner like a pan, it will get plenty of air that way. Make a habit of saving old bags and twisties from bread or hamburger buns etc, they can be reused many times. If you can’t get all the flour wet, it’s OK. Different flours in different climates accept water slightly differently. Just mix in more water a small splash at a time, and next time consider 6.25 cups of flour, or maybe even just 6 cups. You can vary the amount of salt or yeast. Leave your bread knife in the middle of your resting loaves so you don’t forget to slash before baking; without a slash they will burst into irregular shapes. If you schedule carefully, you can make bread all in the same day: for example, mix at 9, refrigerate at 11, shape at 4:20, bake from 5:00-5:30. You can even bake without ever refrigerating (mix at 3, shape at 5, bake from 5:40-6:10), but the loose and sticky dough will be very difficult to work with, and it will make a big mess. You don’t have to bake the entire bucket at once. 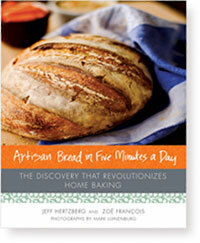 If you love fresh bread (and who doesn’t!) you can keep dough in the fridge and just bake 1-2 loaves for dinner whenever you want. A “staging” bucket to measure 6.5 cups into, because I often lose count and can just dump it back out. Also so I can measure flour before my measuring cup gets wet from measuring water. Two mixing buckets. If I am making two buckets for three sandwich loaves (see below), then I measure 6.5 c of flour into both the staging bucket and bucket 2, then bucket 2 gets dumped into 1 and staging into 2. Ice cream buckets are not built to last forever. When the rim starts to break off, it can be demoted to staging. If you need a new bucket, eat some more ice cream! A staging bucket can be stored with the flour bucket nested inside it. DO NOT let used buckets with dough residue nest inside each other. Without air to dry it out, the trapped wet dough will rot and get really, really disgusting. To avoid this, you can obviously wash the mixing buckets completely clean, or you can also let them air-dry. The remaining dough will dry and mostly flake off, and any other residue will be fine to mix into subsequent batches, it’s the same as propagating a favorite yeast strain with sourdough bread. 1 tsp of chopped Rosemary mixed in with the dough makes a delicious herbed bread. You can experiment with other herbs as well. 1/4 bucket of dough is exactly the same as a bag of wet pizza dough like you can buy at Trader Joe’s. Flour and roll it out as you would think, lay it on a cornmealed pizza peel, add sauce and toppings, and bake at 450 on a stone until the cheese is melted and the crust is done. Two stones means two pizzas can bake at once. If your BBQ is the right size, you can also put your stone(s) on the grill and cook pizza(s) in the BBQ. Divide a bucket into 5-6 slightly smaller round loaves, and this is perfect for making bread bowls for soup. Go with a thicker type of soup/stew — broccoli cheese is the best, but chicken noodle soup would likely leak. 1 loaf needs 2/3 of a bucket, so you need 2 buckets for 3 loaves; mix, rest, and refrigerate as above. The best method I’ve found to cover is to put the pans side-by-side and put a half-sheet baking tray upside down on top of them, but you can also put the pans into bread bags or use saran wrap. At the end of the resting, the dough should mostly fill the pans and might slightly stick to the cover, just lift gently. Slash the tops with a line down the center, and bake for 45 minutes. “Oven spring” should cause the loaves to bake above the tops of the pans into a nice rounded-top sandwich-loaf shape. Rest before slicing, 10 min–overnight. Enjoy one loaf within the next day or two, slice, bag, and freeze the rest. When packing a lunch in the morning, frozen slices are OK, they’ll be fine by lunchtime. To eat quickly, microwave 2 frozen slices for 30 sec, or 4 for 1 min, then toast. Normal: 3c water, 1 1/2T yeast,salt, 6 1/2c flour. Makes 4 round loaves, 4 pizza crusts, 5 bread bowls, or 2/3 of a batch makes one sandwich loaf, and 2 batches makes 3 sandwich loaves. 4/3 batch: 4c water, 2T yeast,salt, 8 2/3c flour. Makes 2 sandwich loaves, but when it rises it will overflow a 5qt bucket. Maybe it would fit in a 6qt bucket? I buy Minnesota Girl Baker’s Flour from Costco, last I checked it was like $13.50 for a 50lb bag. The recipe calls for unbleached, but this hasn’t given me any trouble. I store flour in the garage in this 18 gallon hopper with a hinged lid. If you go through the flour as fast as we do (50lb every couple months), that will work fine. But if your flour sits around for too long, it can develop bugs, because all flour has bug eggs in it. To prevent this, freeze the flour for a few days, in batches if necessary. I buy Red Star yeast in a vacuum-sealed brick from Costco, last I checked it was $4.39 for 1lb? I store the yeast in a jar in the freezer. It stays loose, will keep forever, and I can measure it straight from the freezer into the bucket. At about 4.25 oz/cup, 50lb of flour is about 188 cups, and 188/6.5=29 buckets, so it’s about $13.50/29=$0.46/bucket in flour. Salt and water are even cheaper, we’ll call that another $0.01/bucket for a total of 55c/bucket. At four round loaves or pizza crusts per bucket, that’s 14 cents each. At five bread bowls per bucket, that’s 11 cents each. At three sandwich loaves per two buckets, that’s 37 cents each. The boys have been watching a lot of Food Network lately, such that #3 named himself Ted Brown and decided to host a combo of Cutthroat Kitchen and Chopped for dinner tonight. Ted Brown got 62 dollars of play money out of his Allowance board game, and divided it equally between the contestants. The theme was “Elevated Sandwich”. The contestants both faced a basket containing blueberry bagels, cream cheese, turkey lunchmeat, and leftover cous cous (full of dried fruits and nuts). Mom got quickly to work on mixing cream cheese into the cous cous and forming patties that she started frying in the nonstick pan (which she was quick to grab before Dad had a chance! ), and popped a bagel in toaster oven. Dad assembled turkey, cream cheese, and jelly sandwiches on inside out bagels (except for one bagel half was not inside out), cracked an egg, dipped the sandwiches in and started frying his inside-out french-toasted Monte Cristo. Auction one was to have to incorporate bagged iceberg salad. Dad figured he had no clue what to do with the cous cous and could make a combined salad with the lettuce so he didn’t bid it up too high. Auction two was to do no cooking at all for 5 minutes. Dad let himself lose this one too because he was able to flip his sandwiches and put the pan on low, so they could survive for 5 minutes. During the 5 minutes, Mom added some turkey to her pan to heat up, and then added turkey and cheese to her bagel halves in the toaster oven. After the timeout was over, Dad made a bed of lettuce, and topped it with cous cous mixed with the fresh-chopped apple and balsamic vinaigrette; also he made a small bowl of dipping sauce with strawberry jelly and a touch of Log Cabin (to play off the French Toast theme). Unfortunately, due to cooking, the bagels were tough, and the cream cheese was slippery, so quartering the Monte Cristos was a massacre. Mom plated her bagels as open-faced turkey melts with the cous-cous patties on top. Since #3 was the host, #1 and #2 were the judges. As all the food was delicious, it was a tough decision. The sweet blueberry bagel was not the best for pairing with its savory toppings, but otherwise the patty was very good. The butchered Monte Cristo was seriously docked for presentation, and some judges found the whole thing too sweet. Also, the cous-cous salad was overdressed. It was for those reasons that Dad was Chopped, and Mom walked away with a $21 prize! One of my favorite things about taco shacks has always been those little baggies of hot carrots. I finally did a little research and started making my own — can a snack get any healthier? I developed my own method starting from here. Bring 2c vinegar and 1c water and 1/4c sugar to a boil, make sure sugar is dissolved. Add carrots, onion, garlic. Add liquid (2:1 vinegar:water) just to cover. Sprinkle generously with oregano, covering the surface (optionally sprinkle on red pepper flakes for extra heat). Bring back to a boil. As soon as it begins boiling, add and gently stir in the jalapenos (some juice is ok), and keep the heat on to boil for 2min30sec. Turn off the heat, cover, and let it steep until room temperature. Move to container(s) (including liquid) and refrigerate. This gets very economical (certainly compared to 50-75c for a dozen carrot slices in a baggie) if you buy 10lb bags of carrots and 1gal jars of jalapeno slices from Costco. So this recipe is rather subjective, as well as progressive. Start with this basic method, and save and strain the liquid for subsequent batches (when making each batch, boiling = sterilizing), topping up with additional 2:1 vinegar:water. Adjust subsequent batches depending on how you liked the previous one. Was the previous batch too sweet? Then add no new sugar, and the previous liquid will get less sweet by topping up with fresh vinegar. Too vinegary? Add a couple spoonfuls of sugar with the fresh liquid. Not hot enough? Use more jalapenos and/or red pepper flakes. Carrots too crunchy for your preference? Try boiling for 3:00. Too soft? Try backing off to 2:00. Etc. As you reuse the liquid for more batches, it will get more green, as more jalapeno mushes into it. But it will also get more rich (not so sharply vinegary). As you go along, you can manage it by balancing previous liquid with fresh liquid. Another tip that you might find helpful. It took me a little bit to find the best way to slice the carrots. For maximum size, you want to slice them very much on the bias, almost completely lengthwise. The best way to do this is to hold the carrot in your left hand, angled about from 1:00 to 7:00 on the cutting board, and the knife in your right hand at 12:00. This way you’ll get the right angle without having to hold your knife in an awkward, dangerous position (that is, if you are right-handed. Reverse as appropriate). Try to find a side of the carrot that you can rest stably on the cutting board so it won’t rotate or slip when you cut. EUREKA: Blitz this stuff (carrots, onions, jalapenos, garlic, after lightly draining of liquid) in a food processor, and this makes an awesome spicy carrot relish! Try it anywhere you might use salsa, it’s especially good with melted cheese: in quesadillas, in an egg&cheese breakfast burrito, on nachos — and for a real mind-melt, try spicy carrot relish on Ruffles-nachos! Buy yeast and flour at Costco (or Sam’s or whatever). I started with a three-packet strip of yeast for a couple bucks at the grocery store, and that made two batches (8 loaves). Then I bought a little glass bottle on sale for $7.something, and that lasted a few more batches. Then I checked at Costco, and a giant vacuum-packed brick of yeast (was it two pounds?) cost about 5 bucks. That’s enough for probably 100 batches, probably more. It will keep indefinitely in the freezer, and probably last a year or two. Similarly for flour. I think it was 3-4 bucks for a 5lb bag of flour (2 batches=8 loaves). At Costco, it’s maybe 7-8 bucks for 25lb, and I think I saw $12.99 for 50lb. The thing is that flour has bug eggs in it, and will hatch bugs if you don’t use it quick enough. UNLESS you can freeze it for a couple days. We have plastic containers we can divide the big flour bag into, fit in the freezer (taking turns if necessary), and then it should be good to sit and wait indefinitely until we get around to baking and eating it. The recipe calls for unbleached, all-purpose flour (or slightly less bread flour). Costco only sells bleached, but it hasn’t given us any trouble. At the prices above, I have calculated that the ingredient cost comes out at under 20 cents per loaf. You need a pizza stone. The website warns against Pampered Chef pizza stones, they apparently break a lot. They also say you need a pizza peel (wooden megaspatula) and cornmeal to slide the dough onto the preheated stone and scoop it back out, but we have found that we can use just flour to prevent sticking, and carefully place the dough onto the hot stone. You also need a bucket with a lid (with holes). If the bucket and/or holes are too small such that the risen dough plugs the air holes, the yeast exhaust isn’t able to vent properly, and the bread takes on a bitter, beery flavor. We started with a mixing bowl with a plate on top for a while, but it was pretty messy and crusty. So here’s what you do: you go to Ralph’s and buy a 5-qt bucket of ice cream (not Albertson’s or Vons, they only sell 4-qt). If you have any trouble disposing of the ice cream inside the bucket, contact me immediately! Poke (or for a neater look, drill) some holes in the plastic lid. I made five quarter-inch holes. For measuring salt and yeast, I have a 2Tbsp metal coffee scoop. The recipe calls for only 1 1/2 Tbsp of each, so I carefully measured 1 1/2 Tbsp into the scoop, and marked the level with a sharpie for easy future reference. There is considerable room for slop in the recipe. Salt: I found my first try of the recipe to be a little salty. Salt can be reduced to taste, without concern for any other adjustments. Yeast: can also be reduced, if you account for it properly with time. Read here. Flour: as they recommend, I level the six cups of flour with the back of a knife. But the last 1/2 cup I simply eyeball. Water: I just take whatever warm/hot water comes out of the faucet. As the recipe indicates, the initial counter rise time is not important. 2-5 hours. Or even overnight. First I measure the water into the bucket. I used to measure the salt & yeast into a separate cup and then sprinkle it in to try to avoid clumping, but after watching the YouTube video, apparently you can just dump it in and not work too hard to break up the yeast clumps. I still measure the 6 1/2 cups of flour into a separate bowl, so if I lose count I can start over. I pour in half the flour, whip it into a slop for about 30sec, and then pour in the rest, and mix until all the flour is wet. Sometimes when I have trouble getting some pocket or corner of flour wet, I’ll expose the dry part, and slosh a little bit more water in. It’s ok. The recipe is not kidding when it says that bread can be made right after the counter-rising, but it’s easier if the bread is refrigerated. Plan ahead so you have time to refrigerate the dough overnight before you need bread, so you can avoid a sticky, sloppy mess. Don’t be afraid to liberally coat with flour in order to get a lump of dough which you can shape without sticking to your hands. To form a loaf, use your (flour-coated, serrated) bread knife to cut a quarter of a batch apart from the rest of the bucket, use the knife to pull/stretch the dough out (it won’t cut completely separate) and plop it into your flour container and flip it over. A couple teaspoons of rosemary mixed into the dough is real good. Maybe chop it a littler smaller than whole leaves, or whiz it quick in a spice grinder. Experiment with your favorite herbs or spices! Sandwich loaves: prepare two batches of dough (you’ll need two buckets, or a really big bucket — that still fits in the fridge! ), sit out for 2+ hours and refrigerate as usual, then divide the whole double-batch into three equal portions, stretch/shape as usual except allow them to elongate, put them in three PAM’d 9×4 bread pans, bag the pans or cover with something flat (an upside down half-sheet baking tray is perfect for 3 bread pans), let them rise for 90min or more (I will typically put the loaves in the bread pans before evening church around 5:30, let them sit at home until we get back around 7:30), slash the tops just before baking to control expansion, bake in a 450 oven with steam (but no stone needed) for 45 minutes, then turn loaves out of pans onto a rack to cool, slice, bag, and freeze. King Arthur says a cup of flour is typically 4.25 oz. So a 50lb bag of flour has 188 cups, which makes about 31 batches (6c each). Yeast is even cheaper ($4 something for yeast that lasts through at least 100lb of flour? ), and salt is even cheaper than that, and water is even cheaper than that. And gas or electricity for the oven doesn’t cost much either. So I’ll round less-than-48c-per-batch to 50c per batch. So for us, 1 batch = 5 bread bowls = 10c each; or 2 batches = 3 sandwich loaves = 3 for $1.